U.S. commercial crude oil inventories (excluding those in the Strategic Petroleum Reserve) increased by 6.3 million barrels from the previous week. At 422.8 million barrels, U.S. crude oil inventories are about 2% above the five year average for this time of year. Total motor gasoline inventories decreased by 4.8 million barrels last week and are about 6% above the five year average for this time of year. Finished gasoline and blending components inventories both decreased last week. Sales of new single‐family houses in September 2018 were at a seasonally adjusted annual rate of 553,000, according to estimates released jointly today by the U.S. Census Bureau and the Department of Housing and Urban Development. This is 5.5 percent below the revised August rate of 585,000 and is 13.2 percent below the September 2017 estimate of 637,000. It is necessary to raise the interest rate to a neutral level to achieve the target level of inflation. Adjusting the economy for higher rates and world trade policy will determine further rates of rate increases. "The Bank of Canada today increased its target for the overnight rate to 1 ¾ per cent. The Bank Rate is correspondingly 2 per cent and the deposit rate is 1 ½ per cent. The global economic outlook remains solid. The US economy is especially robust and is expected to moderate over the projection horizon, as forecast in the Bank's July Monetary Policy Report (MPR). The new US-Mexico-Canada Agreement (USMCA) will reduce trade policy uncertainty in North America, which has been an important curb on business confidence and investment. However, trade conflict, particularly between the United States and China, is weighing on global growth and commodity prices. Financial market volatility has resurfaced and some emerging markets are under stress but, overall, global financial conditions remain accommodative. The Canadian economy continues to operate close to its potential and the composition of growth is more balanced. Despite some quarterly fluctuations, growth is expected to average about 2 per cent over the second half of 2018. Real GDP is projected to grow by 2.1 per cent this year and next before slowing to 1.9 per cent in 2020". ​​The FHFA House Price Index (HPI) reported a 0.3 percent increase in U.S. house prices in August from the previous month. From August 2017 to August 2018, house prices were up 6.1 percent. For the nine census divisions, seasonally adjusted monthly price changes from July 2018 to August 2018 ranged from -0.7 percent in the Middle Atlantic division to +0.8 percent in the Pacific division. The 12-month changes were all positive, ranging from +4.0 percent in the Middle Atlantic division to +8.4 percent in the Mountain division. Gross mortgage lending across the residential market in September was £21.5bn, some 1.2 per cent lower than last September. The number of mortgages approved by the main high street banks in September was 9.1 per cent lower than last September; approvals for house purchase were 10.1 per cent lower, remortgage approvals were 7.4 per cent lower and approvals for other secured borrowing were 9.8 per cent lower. The £10.0bn of credit card spending in September was 3.4 per cent higher than last September. Over the past twelve months, the outstanding level of credit card borrowing grew by 5.7 per cent. Personal borrowing through loans and overdrafts grew by 2.3 per cent in the year to September, although it has seen a net contraction in the last two months. Personal deposits in total grew by 0.9 per cent over the past twelve months. A consumer preference to hold cash for immediate use is reflected in instant access deposit levels being 3.1 per cent higher than last September. Flash PMI survey data indicated that the eurozone economy grew at the slowest rate for over two years in October as an export-led slowdown continued to broaden-out to the service sector. In a sign that the slowdown has further to run, companies' expectations of future growth slipped to the lowest for nearly four years, with a near six-year low seen in manufacturing. Reduced optimism further dented hiring, hitting jobs growth. Price pressures meanwhile remained elevated, close to seven-year highs. Business activity in the German private sector grew at the slowest rate for almost three-and-a-half years in October, according to the latest PMI® survey data, with both the manufacturing and service sectors showing notable losses of momentum at the start of the fourth quarter. October saw the IHS Markit Flash Germany Composite Output Index slip from 55.0 in September to 52.7, its lowest reading since May 2015. The drop in the index, to a level below its long-run average (53.4), reflected weaker increases in both services business activity and manufacturing output. In the case of the former, growth eased to a five-month low (although was still solid overall), while goods production expanded at a marginal rate that was the weakest in almost four years. Commenting on the Flash PMI data, Sam Teague, Economist at IHS Markit said: "October data signalled a mixed picture for the French private sector. On one hand, service sector activity growth accelerated to a four-month high thanks to stronger new business growth. On the other hand, the manufacturing sector shifted down a gear in October, as firms reported the first fall of output for over two years". A positive start to trading in the stock markets of Europe is expected, following the recovery of quotations at the APR trading mainly in China, as Beijing announced that it plans to take measures aimed at supporting local stock markets. "Unless the data talk me out of it, I view a continued, gradual removal of policy accommodation as appropriate until we get to a neutral policy rate," Mr. Bostic said in the text of a speech to be delivered in Baton Rouge, La. Plan A WILL involve NI in separate VAT area. 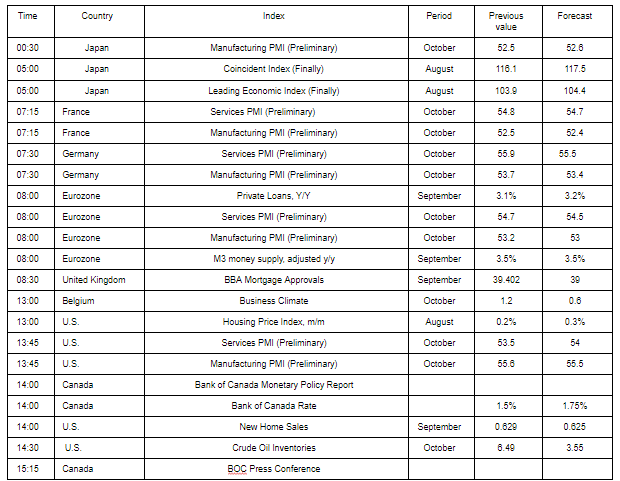 Officials admit "uncomfortable"
Flash Japan Manufacturing PMI rises to 53.1 in October, from 52.5 in September. Growth of key macroeconomic variables (output, new orders and employment) all accelerate. Rates of input cost and output price inflation both quicken to multi-year highs. Commenting on the Japanese Manufacturing PMI survey data, Joe Hayes, Economist at IHS Markit, which compiles the survey, said: "Following a rather disappointing slew of PMI data over the third quarter, Japan's manufacturing sector looks set to start Q4 on a more upbeat note. The latest survey indicated stronger expansions in all the key barometers of macroeconomic health, with output, new order and employment growth quickening since September. Furthermore, export sales rose for the first time since May, despite several respondents highlighting problems arising from global trade tensions. "That said, next month's data will be important to assess whether the latest growth rebound is a transitory response to weakness resulting from recent natural disasters."